The World knows many Ends. 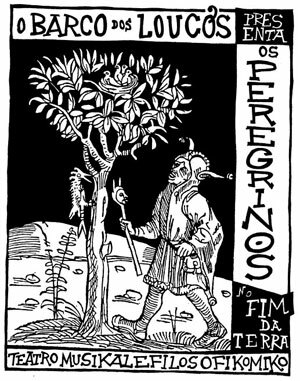 That Holy Year the devoted Fools went on pilgrimage to the Galician port Fisterra (The End of the World), beyond Santiago de Compostella. Where all pilgrims deposed a little jar of their home country earth, the Fools had stuffed their jar with authentic Azart rust. Afterwards, sailing north, the ship was kidnapped on high sea by the French Coast Guard who abducted her to Fisterre (The End of the World) in search of tons of drugs. The Fools were enraged by such a display of stupidity. Twelve years later the abducting Coast Guard Officer, walking in the same anti-government demonstration in Marseille, approached us to confess to be marked for life when he boarded the ship at high sea. He said to have suffered the panic of the Chilean crew members that were marked for life by the Pinochet suppression. Up further north we moored alongside the Amsterdam restaurant The End of the World and still later, for winter, in the Irish town Cork which is An End of the World in its own right.